The elderly show very low rates of access to and use of the new technologies in comparison with their significant weight in the overall population. It is essential to establish alternatives which respond to their needs and promote the access to and use of ICTs among all citizens on equal conditions. This chapter describes an experiment conducted with new technologies in the Red Cross Elderly Day Care Centre in A Coruña, using the In-TIC software and a specific methodology for intervention with elderly individuals. Three different lines of action were followed: initial evaluation of the users participating in the project; intervention by means of digital literacy and therapeutic stimulation sessions with the ICT; and final re-evaluation and data collection. The results obtained provide proof of an improvement in the users’ cognitive abilities, the acquisition of computer knowledge and skills, and the satisfaction of the elderly with regard to new technologies. Information and Communication Technologies (hereinafter, ICTs) are increasingly pervasive in our society, and in the majority of our everyday activities. Access to and use of ICTs provides citizens with a broad range of possibilities in terms of leisure, access to information, interaction, communication, training, etc. (Villar, 2003; Grande, Pereira, Mato & Pazos, 2008), as well as an enormous quantity of resources, making it possible to improve or even increase individuals’ level of participation in activities which are significant for them, thus enabling them to comply with the social demands of the community to which they belong, and attain suitable levels of occupational performance. Taking into account the continuous developments in the field of new technologies in recent years, one could say that the society in which we live has progressed along the path towards the so-called Information Society (Villar, 2003; Grande, Pereira, Mato & Pazos, 2008), a new social scenario characterised by the massive diffusion of computing, telematics and audiovisual communication media (Pousada, Groba, Orozco, Martinez, 2008). Promoting and facilitating the access to and use of ICTs for as many people and in the most egalitarian way possible is essential if individuals are to be able to respond to both their own vital needs and to the requirements and demands of the environments in which they live. Nonetheless, we constantly come across situations in which there is no real access to ICTs and, hence, to this new society which is taking shape before our very eyes. This is true of many handicapped or elderly individuals who, faced with this process of innovation and technological development, find themselves in a situation of exclusion. This phenomenon is referred to as the digital divide, a term which defines the inequality arising as a consequence of certain groups of citizens’ lack of integration into the new technologies (Grande, Pereira, Mato & Pazos, 2008), and consequently, into the so-called Information Society. ICT/ICTs: The Information and Communication Technologies are a set of technologies, components and techniques related to the media and the processing and transmission of information. Information Society: Phase of social development characterized by the capacity of its members to obtain and share any information instantly from anywhere in the preferred form and also characterized by the technological development. 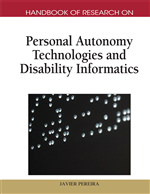 In-TIC: In-TIC (Integration and accessibility of individuals with functional diversity in the use of Information and Communication Technologies) is a software or a support system for the access to and use of ICTs for people with functional diversity, which allows the virtual environment to be personalised and simplified as far as possible using virtual keyboards. Quality of Life: The perception an individual has about his place in existence, in the context of culture and value system in which they live and in relation to their objectives, expectations, norms and their concerns (World Health Organization). Personal Autonomy: The ability to control, manage and take his own initiative, personal decisions about how to live according to the rules and preferences, and to develop the basic activities of daily living. Elderly: Old people; seniors or senior citizens. The boundary between middle age and old age cannot be defined exactly because it does not have the same meaning in all societies. In western societies it is considered old population or older people those who are 65 years old or older; being this threshold arbitrary, but generally accepted. United Nations considers the threshold of the older population over 60 years old. Health: Health is a state of complete physical, mental and social well-being and not merely the absence of disease (World Health Organization).